The data packet will travel through the Internet to computer B. In other words, the data packet need to travel through a number of gateways in order to reach computer B. There are thousands of gateways on the Internet. 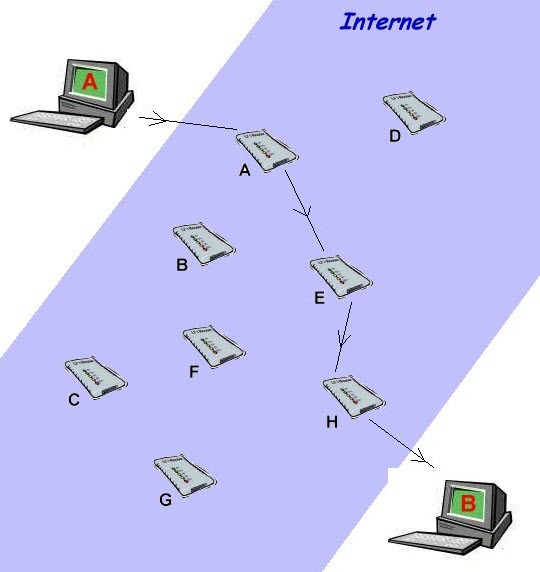 The data packet has to travel through the most efficient route from computer A to computer B. Each gateway has a routing table that will determine the next route for the packet. Gateway A check it’s routing table and found that Gateway E is the best route for the packet. Therefore Gateway A will send the packet to Gateway E.
When Gateway E receive the packet, it will check it’s routing table and found that the next best route is Gateway H. Therefore the packet is send to Gateway H.
Gateway H will finally send the packet to computer B to process. In fact, most data packets will travel successfully to the final destination. However, what if the data packet cannot send to the final destination? There must be a simple protocol that allow the gateway to inform the sender computer about the problem. This protocol is called ICMP (Internet Control Message Protocol).